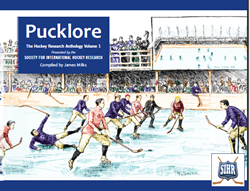 The Society for International Hockey Research is proud to announce the release of Pucklore: The Hockey Research Anthology Volume 1 published by Quarry Heritage Books of Kingston, Ontario. The book is the first publicly available publication from SIHR and features selected articles taken from the annual Hockey Research Journal first published in 1993. Compiled by James Milks, the collection features articles from twenty-two authors from Canada, the United States, Sweden and England and includes noted hockey writers J.W. (Bill) Fitsell, Kevin Shea, Eric Zweig, Paul Kitchen and Jim Mancuso. Pucklore authors celebrate the founder of the game, James Creighton, reveal the first 1,000 goal scorer, trace the evolution of the hockey net, recreate the trial of Allan Loney for murder on the ice, and present more fascinating stats and stories than you can shake a (hockey) stick at. The 268 book has never before seen photos and illustrations laid out in an attractive 10'' x 8'' portrait format. No hockey fan should be without this book. A perfect special occasion gift.